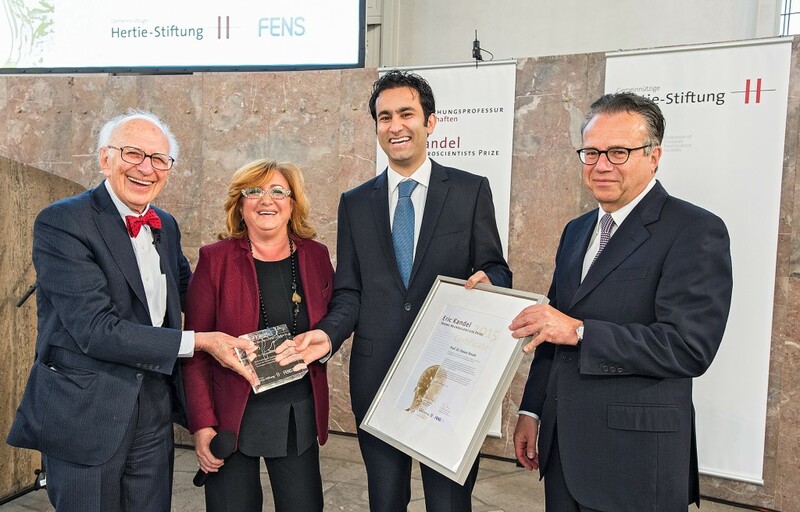 The Hertie Foundation in collaboration with the Federation of European Neuroscience Societies (FENS) has awarded the 2015 Eric Kandel Young Neuroscientists Prize to the physicist and neuroscientist Yasser Roudi from the Kavli Institute for Systems Neuroscience and Centre for Neural Computation, NTNU, Trondheim, Norway. Yasser who is now 33 studied Physics at Sharif University of Technology in Tehran, obtained his PhD from SISSA, Trieste in 2005 and before becoming a professor at NTNU, has worked at Nordita, The Nordic Institute for Theoretical Physics and the Gatsby Unit, UCL, one of the leading centers for computational neuroscience and machine learning in the world. His previous awards include the Bogue Research Fellowship (UCL), the Burgen Scholarship from Academea Europea, the Royal Norwegian Society of Sciences and Letters young investigators award and the Norwegian Academy of Science and Letters’ Nansen prize for young scientists. Prof. Roudi is also a Corresponding Fellow at Nordita and a Research Staff Member of the International Centre for Theoretical Physics (ICTP) in Italy.